Leave a comment on this post for a chance to win one of five copies of Janiel Wagstaff’s Stella Series Books. Immersing young writers in a genre helps them understand what a type of writing is. Spending a few days on immersion, before diving into a unit of study, is always time well-spent. After all, kids need to know what argument, informational, narrative and poetry writing sounds like before they’re expected to produce something similar. Janiel Wagstaff published the Stella series of books, which is about a second-grade student and her classmates who thrive in a joyful, supportive writing workshop classroom. However, the Stella books — Stella: Poet Extraordinaire, Stella and Class: Information Experts, Stella Tells Her Story, and Stella Writes An Opinion — aren’t just books you read aloud once to your students and toss aside. They can be used in a variety of ways. Janiel’s book page includes instructional strategies for each book, suggestions for adaptations across grade levels, and downloads of (the fictional) Stella’s writing that can be used in minilessons (notes, drafts with revisions and edits, as well as final copies). First, Stella, with her can-do, empowered personality has already been a wonderful inspiration to student writers. Teachers can read the books or parts of them aloud simply as a means to motivate their students to write. I’ve shared the books in many classrooms and delight in how even kindergartners take on a persona of confidence and purpose after hearing Stella’s stories. She is, and was meant to be, a positive model for students to relate to and emulate. Throughout the books she engages deeply with her writing, problem solves and preservers to achieve her goals and, in the end, her writing and that of her classmates has real purpose. This is another HUGE theme I’ve tried to convey within the texts—that the writing we do with students should be purposeful so they understand the power of their voices. My hope is teachers take that point to heart and look to find ways to make the writing they do with their students more purposeful, and thus, engaging. The narrative, informative and opinion texts all cover possible explicit steps for teaching the genres while meeting standards. I included these to scaffold instruction for teachers who are newer to the teaching of writing. The steps can be followed as they are presented in each text, while the books are read in chunks/sections, if teachers desire such scaffolding. In my experience doing workshops and talking with teachers over the course of decades, many desire such support, especially in the teaching of writing. Additionally, a plethora of instructional techniques are shown in the books including modeled and shared writing, using a Running Topics List, oral rehearsal, peer work, using reading to stimulate writing, etc. Even more experienced teachers look for ways to enhance or breathe new life into their writing workshops, and my hope is there is something for everyone among the books. Another thought is that teachers can use the books to revisit teaching points throughout the year as they continually write in varied genres with students. Say, for example, a teacher would like to encourage a group of students to branch out on their own or in partners to write on a topic of interest. She might revisit the questioning, organizing, researching and note taking sections of Stella and Class: Information Experts to stimulate discussion of this process. Another example: say a student is stuck and cannot come up with an ending for his piece. A teacher can turn to Stella Writes an Opinion and review what strategies Stella used to overcome that same problem. Possibilities for revisiting teaching points whole-class, small group, or with individuals across the books abound. But how can these books help struggling writers? Janiel answered that question, even before I asked it, on her own blog. Let’s not forget the strugglers: those who stare at the page blankly, those who wrestle with spelling, those who are crippled by perfection, those who feel they have nothing of worth to say, or those who begin a new school year, with long, sharpened pencils, fresh notebooks and a profound dislike for writing. I thought a lot about them as I formed Stella, because it’s students like her who help lift the writing bar. Stella is a model of writing hope. And, alongside her teacher and classmates, her classroom is a place of writing joy. The struggle is worth it, the struggle is worth it. Everyone has a story to tell. Everyone has something we need to take the time to hear. 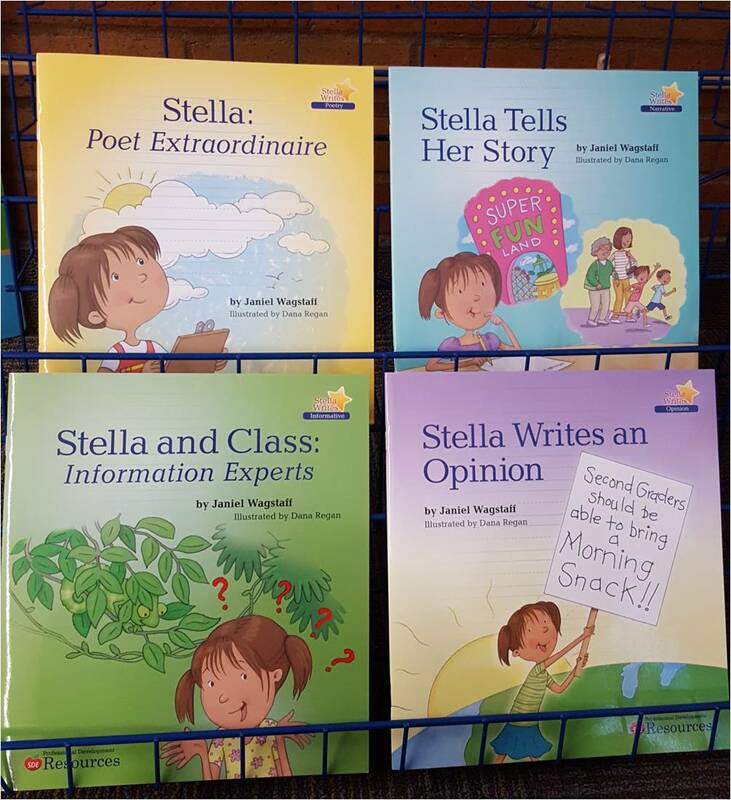 The Stella books are a worthy addition to any primary writing classroom. Not only will they help you ground your students’ understanding about the different types of writing, but they are resources you can use throughout units of study. This giveaway is for five sets of four Stella books. Many thanks to Staff Development for Educators for donating this series to five separate readers. For a chance to win one set of the Stella series books, please leave a comment about this post by Sunday, May 22nd at 11:59 p.m. EDT. I’ll use a random number generator to pick the winners, whose names I will announce at the bottom of this post, by Tuesday, May 24th. If you are the winner of the book, I will email you with the subject line of TWO WRITING TEACHERS – STELLA. Please respond to my e-mail with your mailing address within five days of receipt. Unfortunately, a new winner will be chosen if a response isn’t received within five days of the giveaway announcement. These books sound great! Would love to win a set and try them out in the classroom. I would love these for my class!! Thank you so much!! These would be great a resource for my classroom! This would be awesome to add to my toolbox!! I would love to use these books as mentor text while teaching writing! They would be great for my first graders! These books would be perfect for my strugglers. Actually, they would be perfect for all of my children. Thank you for sharing! These books sound wonderful! I would love to use them in my 2nd grade classroom! I love the idea of a series in writing. We see many series and character books in reading. Can’t wait to dive into these books next year. This would be another great addition to my mentor text collection. These books are perfect for helping primary students learn the characteristics of each genre of writing! Thank you for putting out the information about this great resource! What a creative and fresh approach! I’ve been using writing curriculum for two decades now, and I don’t say that often. I would love to use these with students. I would love to use these books in my 2nd grade class! I would love to win these books for my sweet young writers! It’s so neat that she had already anticipated the question about struggling students on her blog! These seem like the perfect books to use again and again for instruction! I love that students can fall in love with Stella, and revisit a her as she writes across genres. I would also do an author study with these series and ask the author if Stella’s character is based on and inspired by real person? If so who? Hi Priscilla! Great question. No, Stella is not inspired by any one student. She is an amalgamation of students I’ve had in years past. The books contain many real scenarios from my classrooms over they years, though. For example, every example in the poetry book came from my years in second grade. My son, Max, who is a second grader this year, was rather annoyed that I decided to make the main character a girl! I really could have used these books while teaching writing in genres to my ESL students. Now I can use them in workshops about doing the same. All kids learn more enthusiastically when there’s a narrator they can identify with. I am sincerely touched by all of your wonderful comments! Thanks so much, everyone! I’m monitoring the conversation to see if any other questions arise. Happy writing! These are awesome! I am constantly looking for books in each writing genre! Thank you for giving me the opportunity to win these Stella books. I will be teaching fourth grade writing this year and would love to have the books to engage my students. I am excited to purchase these titles for the teachers in my school. They look and sound wonderful! Thank you for sharing, always looking for writing resources! These would be a great support to primary writers as they grapple with the modes of writing. Your books look like an awesome resource! Thanks for sharing your post with us! Love your comment, Nicole! That’s the big idea I was going for with Stella. Good luck! A heroine who insipires other kids to write…Stella sounds like someone I want to introduce to teachers and students alike. Excited to see the books! Very clever to have a series of mentor texts where the student is doing the writing work. Love the idea of using it in small group work to support students where they are at! These look amazing for all students! Thanks for sharing! I would love to share these books as a reading coach with the teachers in my building. WOW!!! What an incredible list of mentor text titles… none that I was familiar with!! Thank you for this unbelievable resource!!!! Thank you, I am always looking for mentor text ideas! Immersion in the genre through reading workshop is so key prior to writing. Thank you for sharing these mentor texts. I have not heard of them before! What an amazing idea! I can’t believe we haven’t seen anything like this before:) I love using mentor texts as a model with students, but this offers a new way to share explicit teaching! I love the idea of teaching the forms of writing with mentor text!! This looks like an incredible tool! It would be amazing to win and either way I think I”ll be looking to get these! I’m not familiar with Janet’s books and would love to read them and add them to my units of study. I love that we can use Stella’s writing as a mentor text. I can see the students connecting to that! These books would be perfect for my mini lessons. Writing is such an important component to literacy and like most 2nd grade teachers, I find myself searching for a book that engages my students and demonstrates the writing procedure. These books are a writing teacher’s dream! I would love to use these books in my classroom. What a great idea. I would love to use these as mentor texts! What a brilliant idea. The perfect way!! Love the thought of using them soon. Hoping to win. These books would really help students understand the different writing genres! Looks like a great resource!! Love to use books to help kids get writing! These books are exactly what I have been looking for! What a wonderful resource! What a great idea for supporting young writers! I’ve been looking for books to introduce each writing genre! So glad they went through my Facebook feed today because they look wonderful! What a great idea! I believe that learning through story is one of the strongest ways you can learn, especially children. I can’t wait to read these books and use them in my classroom. I would love to win a set of the books. It’s always great if students can follow a mentor text character from one writing genre to another. If I win, I will share with my grade level team mate. How timely to read about these now–just spent an afternoon at a district ELA meeting creating lists of mentor texts. We’ll add these for sure, but it’d be great to win them. Thanks for the comprehensive review! Stella books really help the second graders understand the different types of writing. My class loved them. I would love to win a set for my student teacher. These sound fabulous! Would love to win! I would love to have these books for my classroom? My primary students will connect with Stella’s journey as a young writer. I am so excited about these books! They look like the perfect mentor texts for our kindergarten writers! I love using literature to introduce and teach writing. Mentor texts for primary grades are difficult to find. These look great! Thank you for your wonderful posts! Kids love to read about other young writers. It inspires them! I have heard wonderful things about these books. Thanks for the chance! I would love to win a set of Stella books. This is genius – and so relatable for early writers! I will definitely be adding these to my arsenal! These look like they would be a great complement to other Writer’s Workshop books and tools I use! Would love to win a copy! I love these books! I would love to have them in my classroom! Janie’s has a hit on her hands! Our kindergarten team (8 of us!) is in search of mentor texts for next year. Our school will be purchasing for each of our classrooms, and we would love the opportunity to check these out! Perfect when teaching Writer’s Workshop in my first grade classroom! This looks like a fantastic resource! I can’t wait to read them. Wow! I would love these. I am moving to grade 2 next year and can use all the suggestions I can get. Great set of books! I would love to win a set of these books for my classroom! Keeping fingers crossed for Stella books!! Stella looks like the perfect addition to any Writer’s Workshop! Love exposing kids to characters who are writers! Thank you for sharing! I’m always looking for books that inspire my students. These look like books that will touch kindergarten writers. I would love these to read to my kids. I love it when books are written from the perspective of a child! Would love to have Stella as one of the kids in my classroom. Would love to have Stella in my K classroom. These look amazing! Can’t wait to share them with my second graders next year! So excited to see mentor texts geared towards our learning objectives! I’ll have to pick up a set even if I don’t win! These books are new to me, and they look so promising! Thank you for the chance at winning them! I’ve never heard of these series before. They look great and would love to win! Thanks for sharing! 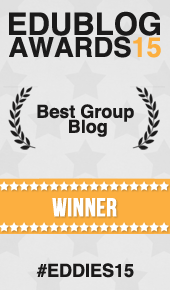 I am so glad to have started following your blog! As an Instructional Technology Coach, I am always looking for connections between curriculum, instruction and technology. I am not familiar with the Stella books but will definitely be checking them out. I am currently reading Flip Your Writing Workshop by Dana Johansen and Sonja Cherry-Paul and they discuss many of the same struggles that students have with the writing process (i.e. staring at the blank page). I can’t wait to compare how Stella and her classmates find ways to work through these struggles with the strategy of flipped learning. These books look amazing! I hope I win. As a middle school teacher, I’ve found that picture books are often the perfect introduction to a topic. These look like they would be great. Would love to use these for my 3rd graders! We love writing workshop. These books look like another “must have” set to add to the collection. I teach first grade, and also interventions to older students. They look perfect for writing interventions! I will have to buy these if I don’t win a set! Thanks for sharing all the incredible literature! This is exactly what I’m looking for! As the literacy coach of a Title I school I need to reach students K-6. Writing is the hardest subject! These look like a must have set, so I hope that I win them, but if not, I will have to buy them! I teach first grade, but also interventions to older students, and these sound perfect for some writing interventions! So impressed with all of the ideas I get from Two Writing Teachers blog. I am always trying to perfect the way I teach and model writing for my students. I would love to win copies of these books! Fabulous looking resource – thank-you for sharing another great way to share writing! Appreciate all you do! I enjoy that the books include the power of the struggle and the process, verses the polished end result. I hope to use these books in the future within my writers workshop. Thank you. I am so excited about these books! I teach dual immersion in a 50/50 Spanish model. Because of this most of my students are ELLs that need this kind of resource to help them learn to write effectively. This would be very helpful for our team to use in first grade. Thanks for the chance to win. What a great book idea! I would love to share these with the teachers in my school! These books sound like an amazing resource to share with kids! I can’t wait to get my hands on them. What a great way to encourage young writers! Thanks so much for your question. I agree with you. The books are great additions to the Units of Study since they reconfirm the lessons taught therein from the perspective of Stella and a classroom in action. Additionally, I appreciate how you noticed the ’empathy, perseverance, and flexibility’ themes. I wrote the books with these in mind, attempting to reinforce how important, useful and healthy these mindsets are. Successful, joyful writers work from these stances every day! You are most welcome, Allison. Thanks for your interest in the books. Happy writing! Thank you, Janiel, for sharing your thoughts, and for taking the time to respond. I look forward to adding your books to my collection. Stacey, Thanks for this post. I’ve been seeing these books for a while, but didn’t really know much about them. Question: how do they fit in with the Units of Study from TCRWP? At the very least, it seems they would be great just having stories about kids writing; seems like it could help students feel less anxious about writing, and give them a character they could identify with. I also thought a lot about the book A Mindset For Learning as I read this post. The stances of empathy, perseverance, and flexibility jumped out at me. I know Kristine Mraz and Christine Hertz advocate teaching these, and other, stances through the use of storytelling. These Stella books seem perfect for that. What do you think? I will ask Janiel to get back to you. Thanks, Stacey; I appreciate that. I would love to add these to our classroom. Fingers crossed! Love the simplicity of these books that can be used so much in the classroom! These look amazing. Crossing my fingers!!! These books would be wonderful to use in my classroom and to share with colleagues! Thanks for sharing! This would be a wonderful resource to have in the classroom. Thanks for the opportunity to win a set of these books. Oh what a treasure! I wouldn’t want folks to think this set of picture books would only be a good tool for primary writers – I think they would work for all ages! What a wonderful idea to share these book titles with my colleagues! These books look amazing as a resource for writing with my kindergarteners. These look like a great addition to my classroom library! These look fantastic! Hope I win them!! These look great! I would love to use these with my kids! Excited to use these next year! These books look WONDERFUL!! I would LOVE to add them to my library for a new approach to teach writing in my 5th grade classroom! We would love to use Stella books at our school! Sending this post to my first grade teacher mentor who first got me into Reading and Writing WOrkshop- it is so fun to turn HER onto new wonderful resources. Thank You! What a wonderful opportunity! I would share these with teachers through my role as a literacy coach. I would love to win this resource to use with out emerging writers! These books would be so beneficial in explaining these types of writing to my students with autism. Picture books are always a clear, motivating way of demonstrating these types of writing. I would love to be able to add these books to my library. These look like great books to jump start each writing genre. Our second grade team would absolutely love to have these books!! I would love to use these books even with my middle schoolers! I feel like I hit the jack pot with these! These look like great anchor books to kick off each writing genre! These look fabulous. I would love to get a set! Thank you for sharing these books! They look like great mentor texts! This would be great for my school. I would love to use these with my students! These look fantastic! Excited to see anything by Janiel. These books so incredible! I will have to put them on my supply list at school no matter what. All the teachers at my school could use these books to help them teach writing. Thanks for sharing! I’m really excited about using the Stella books as great resources for a variety of writing needs! I love the idea of these books – inspiring both writing and reading. This is a great way to introduce the four different writing types to young students. They will use these four for the rest of their days in school (and beyond). These books would be a great addition in my 4th grade classroom! Thank you for introducing educators to these titles. No matter how many years an educator has spent in a classroom, it always helps to get a fresh perspective or a reassurance that teaching writing does not always have to be so hard and once the purpose for reading/writing a text has been clearly defined, there are endless opportunities to use the text a number of times in a reading/writing workshop! These books like wonderful additions to my mentor text collection. Thanks for sharing! Writing these books was a great idea! Thank you for introducing the Stella series! It sounds perfect for many grade levels. Great point, Sarah. I think the books are great for transitioning from one genre to another, then revisiting to dig deeper or reinforce specific teaching points. Happy writing! These books would be so helpful when teaching and switching from unit to unit. I use Lucy’s curriculum for writing workshop and these would help my students with the transition to a new genre. I must have these books, and getting them for free would be amazing! What a great way to introduce a new unit in workshop! Hi! This was my first year teaching. I wish I’d had your Stella series to use as a resource for teaching writing. My first grade students struggled more with writing than an other area of learning. It sounds like your series would be a very helpful tool for both my students and I! This is EXACTLY what I need for my 2nd graders. I look forward to introducing my new group to Stella in the fall! What a wonderful resource! We just began Writers’ Workshop this year and this would be a great addition to our resources! These books would be a great addition to my writer’s workshop library! I would be thrilled to win them for my Kindys! What a great way to kick off different units! Brilliant idea! Wow!!! A book set every primary teacher should have in the classroom. Could you imagine students picking up these book on their own to support their writing after they have been introduced? Could they be used as a writing tool to support independence or students teaching others? Look forward to reading them and imagining the possibilties for the writers in my multiage classroom. I teach Kindergarten, but definitely could use your books as an introduction to my students about these types of writing. I would love a set to share with my team! Thank you for this opportunity! I would love to share these books with my students and team mates!!! Maybe Stella can have a classmate named Sam or Stanley. It’s great to have more growth mindset books that relate to reading and writing. I would love to have these for my new classroom. What a great resource for writing that the kids will love! 💖 The name too–Stella! Would love to use these with my first graders during writer’s workshop! Thanks for bringing these books to my attention. What a great addition to the mentor text collection. I’m thrilled to learn about this book series. Sounds like an excellent resource. Thank you for reviewing it and doing the giveaway. These books look amazing. I love using mentor text to teach writing concepts and craft to students. Stella sounds like she continues the growth mindset we have adopted to inspire and give confidence to reluctant writers. Thank you for the opportunity to win them! I would love these books. I have a student teacher next year and these would be a good guide for her, too! What terrific, empowering resources for young writers! This would be a great resource to use!! My first graders would love using these books as mentor texts during writing workshop. These mentor texts would be a hit with my 1st graders! I have always struggled with getting my struggling kindergarteners to get them to self motivate, I think these Stella books would be just the answer! These books look like a wonderful addition to my classroom resources. Thanks for sharing! This series sounds like a great way to introduce students to the different types of writing! Win-win- sounds like great books we could come back to again and again to help with writing in different genres! LOVE these books! I would love for Stella to be part of my 2nd grade class! These would be amazing to use with writing. This text set would be great for my students! I love the reminder about supporting our students to write with a purpose so they can develop their own voice. Thanks! Great set of books for Writer’s Workshop! Wow! What an exciting resource for the classroom. We’d love these for our room. These books would be a fantastic addition to my basket of writing mentor books! I could see revisiting them over and over again! Thank you! These books would be a great addition to our mentor text collection that my first graders use during writing workshop. I would love to have these. I think it would be nice to have a continuing character to help motivate the students through their various writings. These books look wonderful. Totally agree about genre immersion being time well spent. Excited to see these books for their content and instructional techniques. I teach second grade and I would LOVE to have these to use whe teaching the writing units! Can’t wait to use them next year! My students would appreciate these books, looking at writing through another second grader’s eyes. Perfect! “These would be perfect,” says the 2nd grade teacher. I would love to have these books to go along with writer’s workshop in my first grade classroom. Wow I’d love to win these ! I love teaching writing! This set would be a great addition to my lessons!!! I love the idea of having the same character to introduce several different genres! I would love this set!! It looks awesome! The Stella Book Series sounds like just what is needed for my students who struggle with writing! I can’t wait to share the books with my small writing group. Wow! I’d love to have these books to help my students… Thanks so much!!! These books look awesome! It is exactly what I have searching for to use with my students. Would love to have a set of these! I can’t wait to introduce Stella to the students in my school. They will love her!!! I’m always looking for mentor books to motivate children to read! I would love a set of the Stella books! Thank you! What a fantastic resource for the classroom! The Stella book series would be a welcomed supplement to my current writing curriculum. My students would be engaged, inspired writers after learning about the different types of writing through this series. I would love to have a set of these books and share them with other teachers. They look wonderful and would aid anyone’s writing curriculum by engaging and motivating students. I’m always on the lookout for new mentor texts to share with our students to help them improve their writing. Thanks again for bringing this series to our attention! I LOVE this! What a wonderful way to teach, inspire, and encourgage the art of writing! These books sound great for teaching writing. I would love to own a set of them for my classroom. I would love to have a set of these for my classroom! Thank you for the chance to win! As an instructional coach, these would come in very handy! This is just what I need for my 5th grade students. Thanks for the chance! These books looks amazing. I believe that these books will empower and support my students understanding about each type of writing. I will be more than happy if I win these books. I will also share these titles with my supervisor in order for her to purchase the books for each teacher in my school. Love hearing about new books for WW! Thanks! Love the characters and giving kids the inside view of being a writer. Would love to share these with my teachers!! Always looking for how-to texts to reach those younger writers!! I’m a resource teacher for an elementary school. My kids often struggle when writing and I try to give them as much support as possible. These mentor texts would be a wonderful addition to my classroom! Would love to have a set of these to try out in classrooms I coach in!! These look so great! Likely some adults could use the tutorials as well. These fit perfectly with the Writing Units of Study! Great mentor texts. Incredible books! I would love to have them to enhance my writing lessons. Yes, they are. Click on the link in the blog post. Changing grade levels next year and would love this! Maribethbatcho…Funny you should ask that!! Yes, the next set of books will feature a boy character. In fact, my own little writer, my son Max, was quite frustrated with me for starting out with Stella as the main. 😉 Happy writing! I have been looking at this grouping of books off and on for a little while, so I am excited to see them being reviewed here. They would be a great addition to a repertoire of already terrific mentors, but seem like they would be great for the reluctant writer in all of our rooms. I wonder if the author considered having boy characters. So many of my reluctant writers are boys…Thanks for the review and for the opportunity to win a set! My students would really benefit from these. There’s not much out there to help teach this as far as children’s books go! Thank you for the chance. These look like a fabulous resource! Looks like a me a great series! How fabulous!! I would love to use these books in my writing workshop in Australia. Hoping this offer is available for overseas readers of TWT. Janiel’s publisher is willing to ship worldwide. Therefore, if your commenter number gets picked, you will receive the set. I teach writing to fourth graders and am always looking for meaningful mentor texts. These books seem to take the mentor text idea to a new level. I can’t wait to incorporate them in my classroom. Really liking Stella’s “can do attitude!” That’s what I try to instill into all my students. I would love to have these. They look amazingand I would love to add these to my collection to improve my writing instruction for all my kiddos! This would be a wonderful collection for Writers Workshop in my 2nd grade classroom! These books look very engaging and I’m sure students will connect with the stories. Would love to win a set!! These look like inspiring mentor texts! I would love to add them to my collection! These books will be a perfect mentor text for my first graders! These books sound like great mentor texts for the units of study! What an amazing set of books! These would be a fantastic addition to my toolbox! My email is emma.eckert@trsu.org! These look amazing! I need to add these to my selection of writing books! Thanks for sharing them today. I can’t wait to use these books in the fall! Thanks so much for offering this contest! Wowza! Just love it that Stella gets to be the leader in showing students how to get “there” with their writing. Their aren’t many books that are “helpful” to students and that actually guide students. What a great tool for children to be able to also refer back to during the whole writing process. Way to go, STELLAAAAA! Thank you for sharing this set of book, Stacey. They will be a wonderful addition to someone’s classroom. What an awesome idea! These would be great in my classroom. These books will fit right in to my 2nd grade curriculum. My students will love connecting with Stella as they learn the different types of writing. Thanks for the chance to win this set of books. Wow! This looks like a great addition to my classroom Library. I teach Middle School ESOL students and writing is always a challenge. This would give me a great format to show them these four different kinds of writing. These would be a great addition to my writing mentor texts! Writing is my area of focus, so any help is always encouraged! Thanks for doing this! These definitely sound like books I would like to check out! I’m interested in seeing the multiple ways you can use the story. Wonderful resource for a classroom library! Such an important resource – from a student view. Always need student mentor texts! I love this! I can’t wait to share these with my teachers. I am dying to read these books. They sound perfect to use as mentor texts. Mentor texts are such powerful teaching tools. Thanks, Lisa Keeler! As a teacher of writing for 26 years, I knew these were needed. Stella adds a rich layer to our writing instruction. Happy writing! Wow-what a great idea. We have mentor texts and curriculums and books about teaching writing and genres and now this series about a child doing the work of a writer and exploring different genres. So clever. Can’t wait to see these! These books sound like a wonderful classroom resource for teachers and students! As the father of an emerging reader and middle level teacher, the concept of using picture books and narrative writing is intriguing. Thanks for publishing this post. The Stella book series seems as if it will be a powerful way to engage, inspire, and support my young writers. I especially appreciate the resources and suggestions on the SDE book page. Thanks for the opportunity to win a set! What a wonderful way to engage writers and develop their understanding of the different genres! I think this is a wonderful additional resource. Students can return to the book to deepen their understanding. Nice, these books sound like a perfect resource for teaching the writing genres. It is a perfect tool to engage all learners but especially our EL’s.